Simple yet stylish, the Spectrum Diversified Townhouse 8 Bottle Tabletop Wine Rack is sure to organize all your wine bottles for easy access. Made out of high-quality steel, it has a simple design, which looks great with most kind of bar setups. It has a powder coated black finish, which is durable and elegant. The Townhouse Tabletop Wine Rack from Spectrum Diversified is crafted to hold eight bottles of wine without the worry of chipping or breakage. At 2.205 pounds, it is ultra-lightweight... 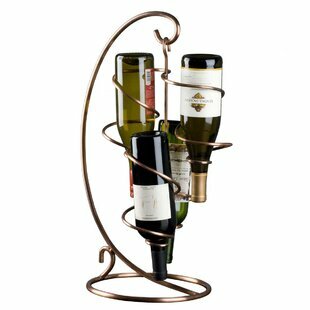 Product Type: Wine Bottle Rack Overall: 16.5 H x 6.75 W x 8 D Design: Tabletop Material: Metal Overall Product Weight: 2.205lb. 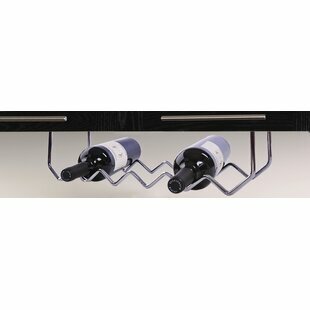 Product Type: Wine Bottle Rack Overall: 120 H x 8.75 W x 2 D Design: Floor; Hanging Overall Product Weight: 18lb. 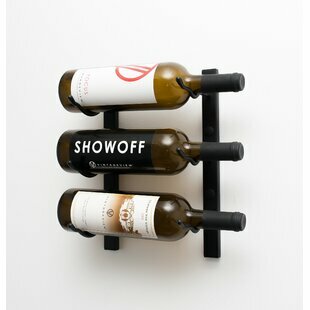 Product Type: Wine Bottle Rack Overall: 44 H x 25 W x 13 D Design: Floor Material: Metal Overall Product Weight: 30lb. 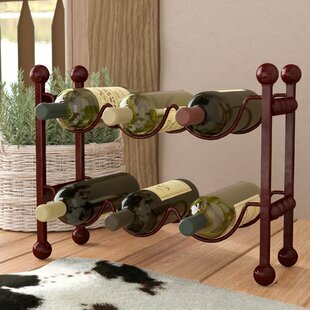 Product Type: Wine Bottle Rack Overall: 32.09 H x 7.87 W x 8.46 D Design: Floor Material: Metal Overall Product Weight: 2lb. 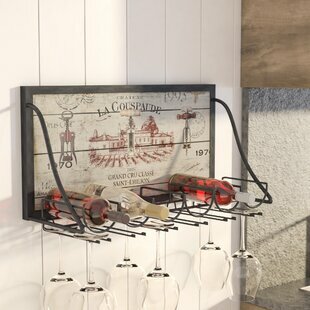 Keep your favorite vintages stylishly displayed and ready to be uncorked at your next soiree with this wall-mounted wine rack. 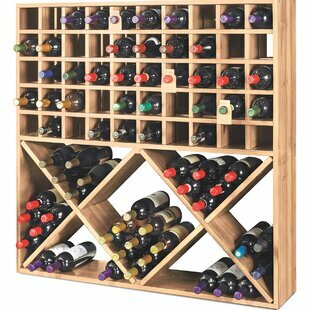 Made in North America from solid and manufactured wood awash in a neutral color, it features two tiers of space for housing up to 24 bottles of your preferred reds, whites, or blends. Plus, it includes space down below for storing up to six pieces of stemware. 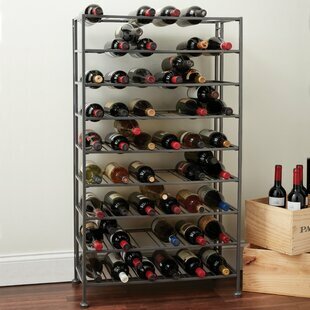 Measures 28.5 H x 28 W x 7.25 D. Stemware Capacity: 6 Product Type: Wine Bottle Rack Overall: 28.5 H x 28 W x 7.25 D Design: Wall Mounted Overall Product Weight: 17.4lb. Craft a cozy cocktail station and corral your favorite vintages on this essential bar cart, featuring a removable tray top. 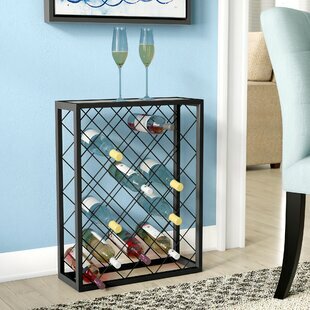 Stemware Capacity: 15 Product Type: Wine Bottle Rack Overall: 29 H x 32 W x 15.5 D Design: Floor Overall Product Weight: 44lb. Made from reclaimed pallet wood, this Truluck Wine Not? 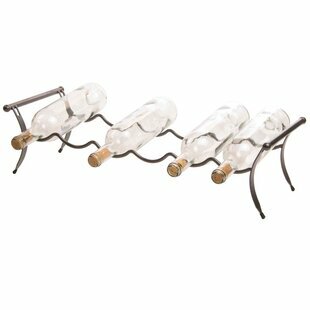 4 Bottle Wall Mounted Wine Rack makes a great gift or addition to your home. The weathered wood is painted in white with "Wine Not?" printed on the front for a unique touch. 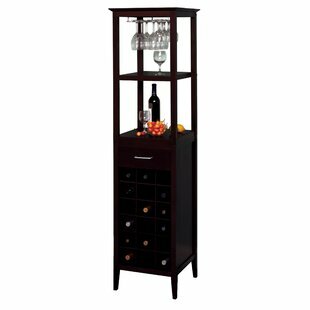 Stemware Capacity: 4 Product Type: Wine Bottle Rack; Wine Glass Rack Overall: 13 H x 20 W x 5 D Design: Wall Mounted Overall Product Weight: 8lb. 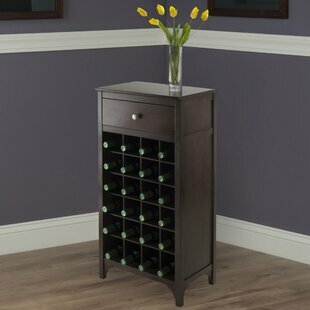 Has your collection of wine outgrown your kitchen cabinets or bar cart? 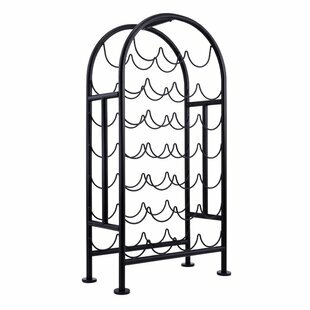 Here to help, this wine rack keeps your vintages neatly tucked away that is, until the guests arrive. 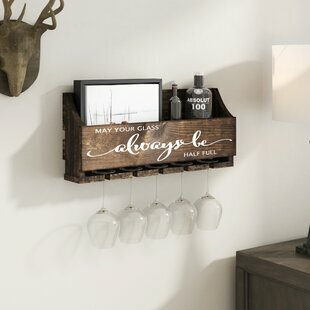 Crafted from wood in a rustic brown finish with the words "May your glass always be half full," it showcases a single compartment to hold six bottles of your favorite reds and whites, with space for five wine glasses to dangle down below. Measuring 10.5 H x 24 W x 5 D, its designed to mount on the wall to save... 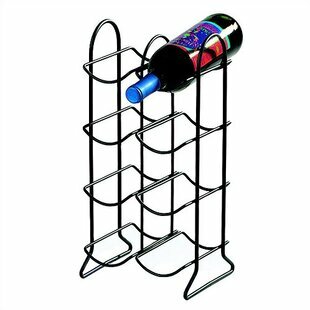 Product Type: Wine Bottle Rack Stemware Capacity: 5 Overall: 10.5 H x 24 W x 5 D Design: Wall Mounted Overall Product Weight: 6lb. Looking to up the ante on your home bar or den? 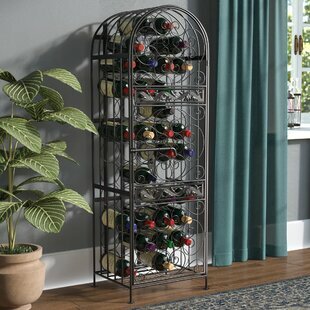 This handsome wall-mounted wine rack adds a touch of statement-making style to your favorite aesthetic. 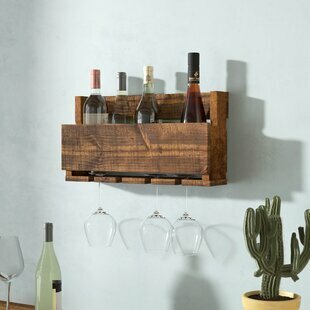 Crafted from metal, this six-bottle wine racks plank-inspired design adds a rustic touch to your decor, while its distressed details bring antiqued flair to any space. 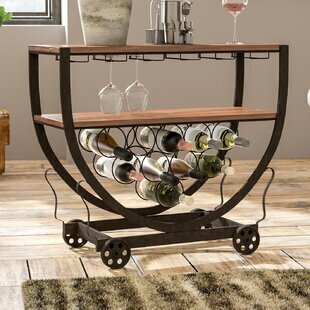 Lean into this wine racks French country influence by adding it to a dining room ensemble alongside a lightly weathered pedestal-base table surrounded by linen-upholstered side... 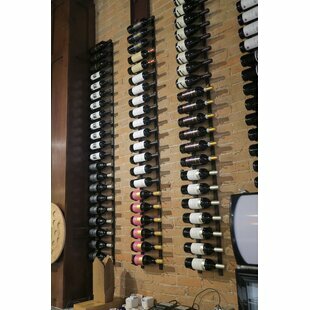 Overall: 14 H x 25 W x 10 D Stemware Capacity: 12 Product Type: Wine Bottle Rack Design: Wall Mounted Overall Product Weight: 8lb. 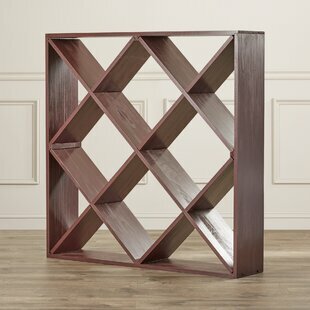 From A to Zinfandel, this wine rack is the perfect home for all of your vino varietals. 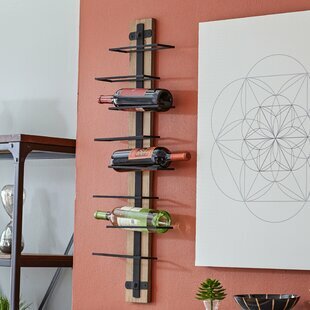 Made in the USA, this wall-mounted wine racks reclaimed pinewood construction brings DIY character to bistro areas, vacation homes, and beyond. The top shelf, protected by a front rail, holds four of your favorite vintages, while four bottom notches hold just as many wine glasses. Measuring only 13 H x 20 W x 5 D, this piece is a sure fit on any wall. 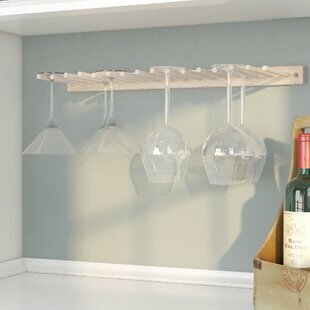 Overall: 13 H x 20 W x 5 D Stemware Capacity: 4 Product Type: Wine Bottle Rack Design: Wall Mounted Overall Product Weight: 8lb. 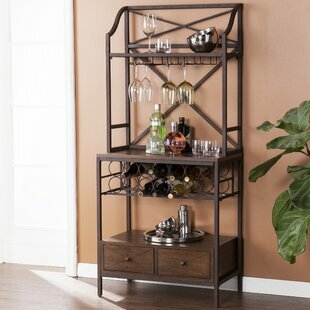 Keep your home bar organized in an optimized with this space-saving wall mounted wine glass rack and shelf! Crafted of solid pine wood in a dark walnut stain for a rustic, reclaimed aesthetic, this wall-mounted design features a rectangular backplate measuring 6" H x 24" W overall. 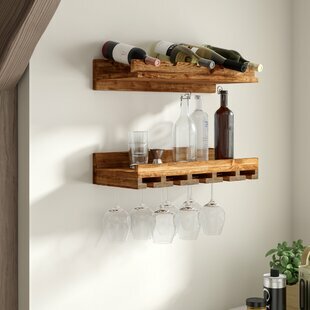 A 10" D shelf with a lipped edge provides a perfect platform for displaying everything from wine bottles to framed photos and collected curios, while the built-in stemware rack can hold up to 15 glasses. Overall: 6 H x 24 W x 10 D Stemware Capacity: 15 Product Type: Wine Glass Rack Design: Wall Mounted Overall Product Weight: 11lb. Keep your stemware and wine glasses organized and at the ready with this understated rack, the perfect pick for any kitchen or entertainment space. 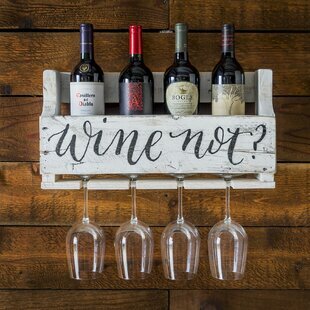 Featuring a subtle design with space for up to 16 wine glasses, this wooden rack is the perfect pick for any kitchen or home bar ensemble. 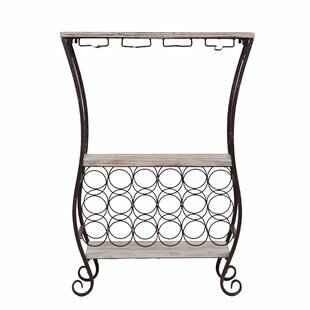 Station it above your kitchen counter or dining room sideboard to tie your look together. 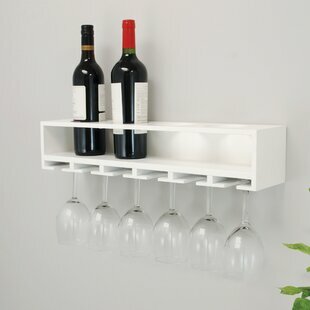 Stemware Capacity: 16 Product Type: Wine Glass Rack Overall: 1.5 H x 21.75 W x 7.75 D Design: Wall Mounted Overall Product Weight: 0.91lb. 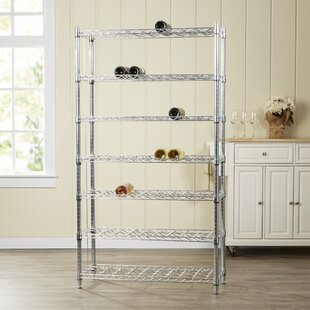 Is organizing your growing stemware collection starting to feel like bumper cars in your cabinets? 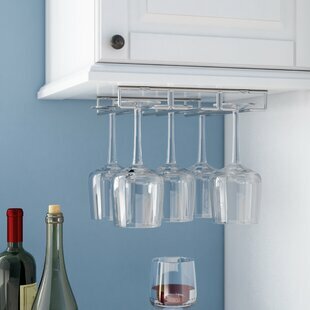 Maximize space and store your wine glasses safely with this hanging rack, a must-have for any well-stocked kitchen or home bar. This designs three rows accommodate up to nine stems and keep dust particles from settling where you sip. 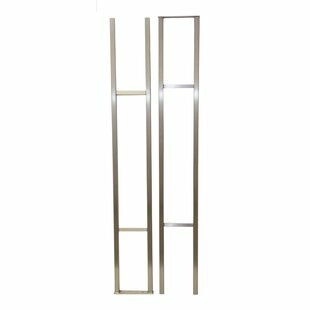 Crafted of sturdy gauge steel, this rack mounts right to the underside of your cabinets and comes in a sleek chrome finish. Overall: 1.5 H x 11 W x 10 D Stemware Capacity: 9 Product Type: Wine Glass Rack Design: Wall Mounted Overall Product Weight: 1.2lb. Add a touch of elegance to your parties and dinners. Attractive design complements any decor. Great hostess gift. Perfect for display. Glasses, bottle opener and wine bottle not included. 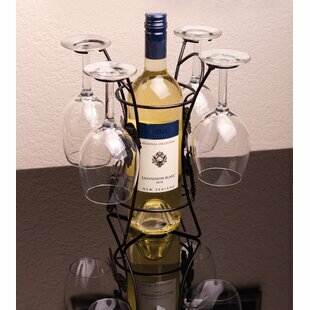 Product Type: Wine Bottle Rack Overall: 10 H x 8.5 W x 7 D Design: Tabletop Material: Metal Overall Product Weight: 1.5lb. 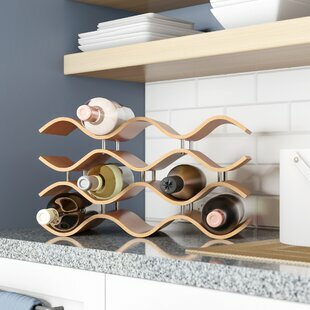 This brand new 1-foot 3-Bottle rack opens any wall no matter how small to a perfect contemporary, label-forward wine display. 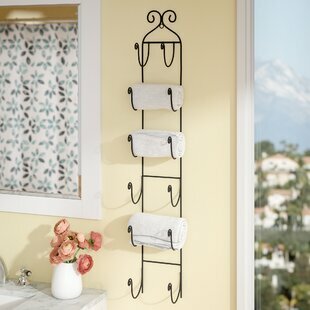 Just one-foot tall, this steel rack nestles into just about any place limited by height, including wet bars, kitchen countert. 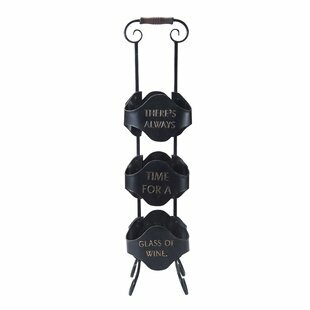 Product Type: Wine Bottle Rack Overall: 12 H x 7.5 W x 5.25 D Design: Wall Mounted Material: Metal Overall Product Weight: 1.6lb. The nexxt claret, a sleek, timeless and modern design wine rack shelf that can hold up to 4 bottles of wine and 6 glasses. 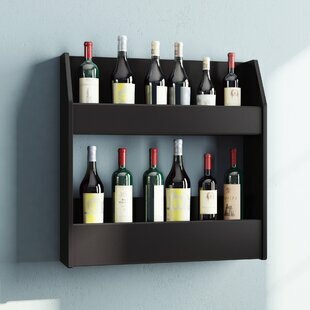 A great way to display your favorite wines. Product Type: Wine Bottle Rack Stemware Capacity: 6 Overall: 4.5 H x 22 W x 5 D Design: Wall Mounted Overall Product Weight: 4.05lb.